Here's the latest in a variety of PERFORMANCE models, now available. This is a shorter scale 640mm version of Kenny's new double top/lattice-braced PERFORMANCE series. The PERFORMANCE model features the familiar SIGNATURE sound ports. This one has beautiful flamed maple back and sides - go to the SHOWROOM for more photos and specs. Double tops have been featured on the SIGNATURE series for many years, and now Kenny has added lattice bracing to the double top in the PERFORMANCE series, while simplifying the model in order to lower costs. The net result is a double top guitar starting at $1500 less than a SIGNATURE. It sounds amazing - very powerful and loud, and yet has sweet and delicate qualities sure to please the discriminating performer. With 640mm string length, it plays easily, and would be perfect for a smaller player. Here's the first European spruce double top Signature with Lattice-bracing and XL body. New iterations keep coming...and this is Kenny's response to the performers' burning desire for the big sound [you know who you are]. Want to fill a hall? This will do it. The body's slightly bigger and the elevation on the fingerboard is slightly higher. We might even get our act together and record something with it as well. More photos and specs available to review in the Showroom. These will be available at the standard Signature price point as a custom order. Please note 2010 Signature pricing will be increasing $500 to $7,000 January 1. The price on this guitar is $7200 with double arched hardshell case. If you're local, please feel free to give us a call for an appointment to try this..and the others while they last. 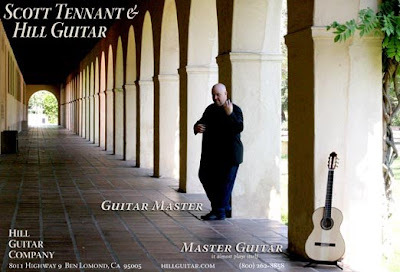 New ad will be running in the January issue of Acoustic Guitar magazine. Photograph by Santa Cruz local Michele Benson. Scott Tennant at Cal Tech in Los Angeles. Scott's got several of our guitars at the moment. Russell Cleveland acquired our Torres FE-18 shown at La Guitarra California last weekend to add to his collection. This guitar is a 640mm Indian rosewood, European spruce model. The Russell Cleveland Collection [Dallas, Texas] is featured in "The Classical Guitar a Complete History." It is one of the finest collections of classical guitars in the world, which features guitars from Torres to the present. We are pleased to have been chosen to have one of our guitars as part of this prestegious collection. Of the 4 FE-18 Kenny made last, we have one 630mm one left. Photos and more information about this guitar currently appear in our showroom.